Hope you enjoy this video. 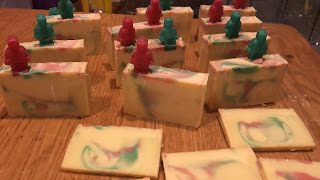 My kids suggested I continue with my youtube soaping videos they helped me with the editing as well. Little lego figures in green and pink as my topping for this soap batch scented with unicorn poop fragance oil. Ingredients are Coconut oil, Olive oil, Palm oil and Castor oil.